Each artboard will be a single page in a PDF document that I will export. 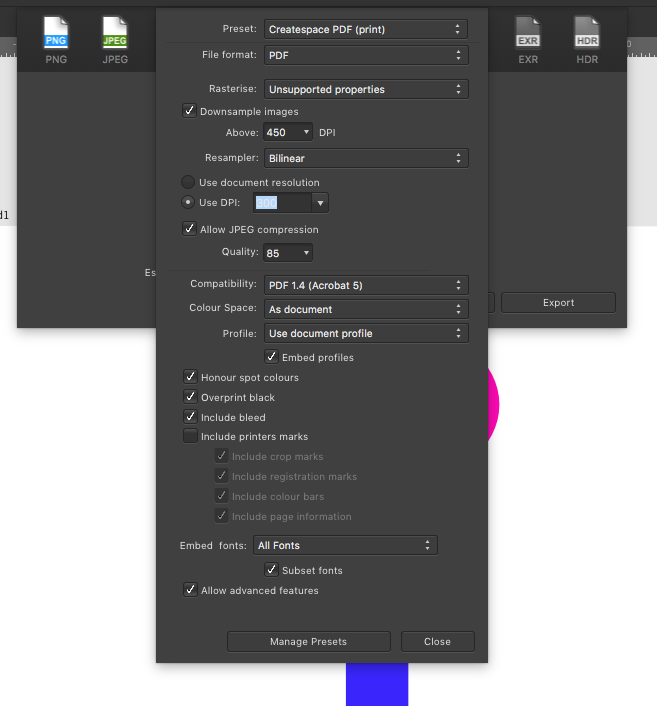 The first option is problematic because in the exported PDF, artwork from one artboard, if larger than the artboard itself, is showing up on neighbouring artboards (i.e. pages). See the PDF attachment: the maroon rectangle overlaps the second artboard and (and the same in reverse for the green rectangle overlapping the first artboard). I'm actually trying to place two artboards side by side to represent each spread in the book in order to actually visualise what the art looks like together as a spread without a gap. So, I was wondering if there is an option I'm missing somewhere in File > Export > PDF that I can turn off artwork from separate artboards overlapping and appearing on other artboards (i.e. pages) in the export? At a push I'm aware that I can use option 2. above as a work around for this problem i.e. 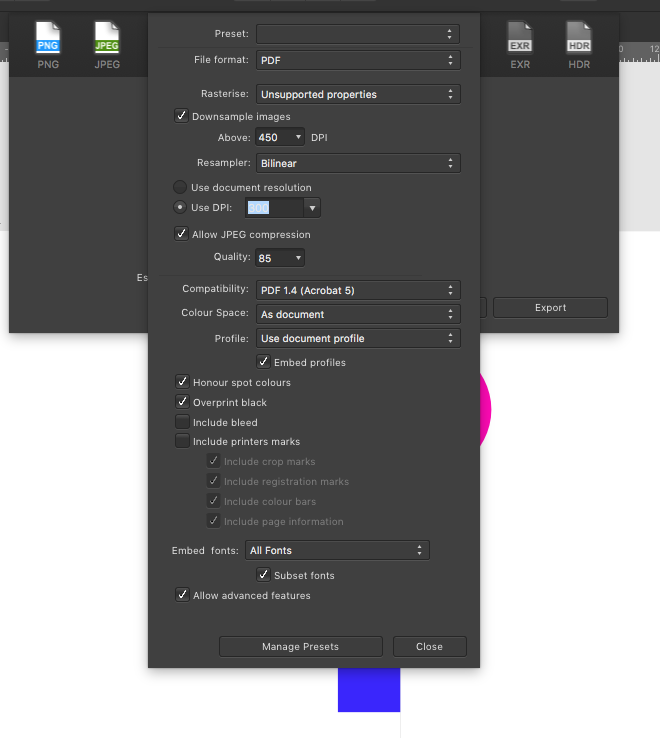 slicing up the artboards using export persona and exporting each board as a separate PDF document. But of course this leaves me with the hassle of having to combine all the PDFs back into one document using some third party program every time I want to export a version of the PDF document for preview. I'm also not sure what effect another round of compression will have on the document and am therefore reluctant to use this method especially as this will be going for print. As standard, Artboards should act in the way you require, any objects should only export to the artboard (and therefore PDF page) that they're on in the document. Could you please provide the test file that you've used to create the attached PDF, and a screenshot of your export settings, including the More section? Hi thank you for the reply. It's great to know that the artboards should work as I expected them too! However, when 'Include Bleeds' is checked (in 'Document Settings', I'm using a 3mm bleed), this is when the problem arises with the overlapping artwork rendering on disparate artboards. As this is a PDF for print I need the bleed functionality so I'm hoping this is a bug and can be fixed! I'd prefer not to go down the route of removing the bleed from 'Document Settings' and adding a 3mm to the dimensions of each artboard (and thereby needing to use a rectangle guide as my dummy trim area.) It would solve the problem of the export because I wouldn't need to check 'Include Bleeds' but I wouldn't be able to place 2 artboards next to each other to visualise the spread because of the manually added visible bleed areas. Many thanks for your help and assistance in advance. Thanks for the further information and your test files Richard, this is more than appreciated. I've looked through our development log and this is a previously known issue in regards to artboards and bleed. The good news is that is has been fixed for 1.7, and is available now in our current beta! I've opened your test file in the beta and used the export options provided in your first screenshot (including bleed) and the PDF is exported correctly. This is so good to hear! I knew it would be worth asking on the forum, so happy about this, thank you! - The post says: '...the beta will install as a separate app - alongside your store version'. Therefore if I start using 1.7 to gain the benefit of the corrected artboards PDF export, when the beta gets finished and becomes the new default for the store version, will my store version (1.6.5) update automatically to 1.7 and therefore I'll be able to delete the beta install? And furthermore, will the subsequently updated store version be able to open the files of the 1.7 beta and therefore allow me to continue working as normal? - Secondly, I also own Affinity Photo 1.6.11. I love the feature File > Edit in Photo... (or vice versa). Will this functionality still work OK between the programs if I begin working in the Designer 1.7 beta? If I'm in Photo, will it open the beta or my store bought version? I could just try it I suppose but I'd be interested to hear your thoughts on the use of this functionality. That's correct, when we release the retail version of 1.7 your store version will upgrade. Very occasionally we end the beta cycle before releasing the retail version, but this isn't a regular occurance. will the subsequently updated store version﻿ be able to open the files of the 1.7 beta and therefore allow me to continue working﻿ as normal? We absolutely try to make this possible, but as it's a beta we can never guarantee it. If at any time during the beta cycle we change or add major features, this can affect our file serialisation and then the files would not open. This isn't something we're planning, or will definitely happen during the beta cycle, but as we can't guarantee it not happening we always recommend that the beta is not used for any critical or production work at this stage. Only if you also download and install the Photo beta, as the serialisation is different between the retail and beta version, File > Edit in... won't work from a retail build to a beta build, but does work between betas! Thank you, this is all great to know. Finally, do you have any indication of when the end of the 1.7 beta cycle will be? Any suggestion on time scale will be good as I'm starting a new major project in the new year and would be great to know if 1.7 will be available. No official indication currently, it will simply be when the app is ready... sorry I can't be more specific! If printing is the only issue however, I'd recommend continuing to create files in 1.6, then migrate a copy file over to 1.7 beta for printing to guarantee no loss of work! Ah yes, this is a great idea! Many thanks once again for all your help, really appreciate it and great that there is a readily available fix!